On 30th December 1970, Param Sadguru Shree Gajanan Maharaj of Akkalkot, uttered a Mantra and gave the command to Shree Vasant Paranjpe to carry HIS blissful words to all peoples of the world. HE first asked Shree Vasant to spread the knowledge of Fivefold Path to four southern states of India and later gave a command to go to USA to spread this Fivefold Path. Thus began Shree Vasant’s thirty-eight years of travel and teaching, of grace and total surrender to the divine. In 1972, He began teaching in USA. In 1973, He became the founder president of Fivefold Path, Inc., a nonprofit organization established in Madison, Virginia. In that same year, Shree Gajanan Maharaj commanded Shree Vasant to start the Satsang newsletter. 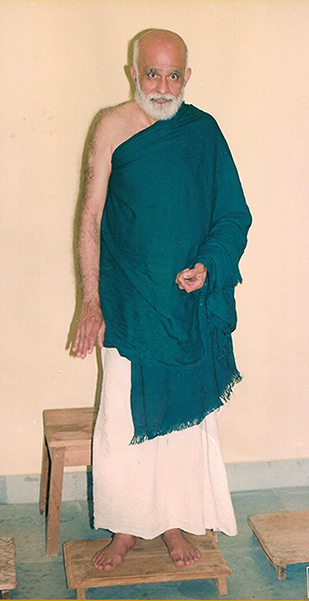 On September 22, 1973, Shree Vasant inaugurated the Parama Dham Fire Temple in Madison, Virginia, the first fire temple in the world established under Shree Gajanan Maharaj’s dispensation of ancient science of atmospheric purification for the New Age. In 1974 Shree Vasant carried the message to Europe. Over the years, His mission also took Him to South America, Australia, Africa and Asia. He was instrumental in bringing Agnihotra and Fivefold Path to thousands of people all over the planet. In 1976, Shree Gajanan Maharaj commanded that an educational and cultural Trust be started at Shivapuri, Akkalkot under the name in English language, Fivefold Path Mission with Shree Vasant as sole trustee, to spread this knowledge. The Mission has been actively working in all states of India right from Arunachal to Kerala and people from various religious groups, Gurus’ groups have taken to Yajnya on a grand scale. In today’s world, Shree Vasant pioneered the use of Homa Therapy in agriculture, psychotherapy, alternative medicine, self-development and healing the environment. Under His guidance, Homa farms and centres such as Bhrugu Aranya in Poland, Om Shree Dham farm in Australia, and Tapovan in India came forth. Shree Vasant is the author of Grace Alone, Light Towards Divine Path, Ten Commandments of Parama Sadguru and Homa Therapy: Our Last Chance. He left behind a wealth of guidance on virtually every aspect of everyday life – practical insight on how to apply the Fivefold Path principles to daily life, to truly “love thy neighbor as thyself”. Shree Vasant’s earthly mission was completed on 30th December, 2008.